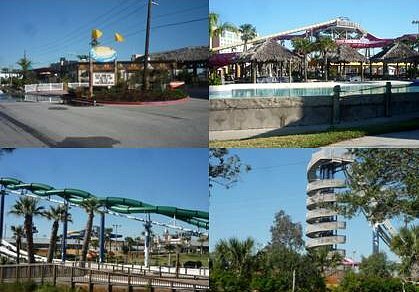 The Schlitterbahn Galveston Island Waterpark is the top amusement park with indoor and outdoor activities in Galveston Texas. It covers a 15 acre area with both outdoor and indoor water play areas. The whole area is connected by a winding tube ride that can be entered and exited anywhere in the park. The waterpark is very close to the Moody Gardens and the Moody Gardens hotel. The park has over 32 amazing aquatic adventures, including uphill water coasters, thrilling speed slides from which riders freefall over 80 feet. There are also whitewater rapids, kid's water playgrounds,a large wave pool, Boogie Bahn surf ride and relaxing hot tubs. The Schlitterbahn Galveston Island Waterpark opens all year round because it has a large section that can be enclosed and heated for the winter season. The winter section (Wasserfest) includes over a dozen attractions such as tube slides, heated rides, thrilling body slides, speed slides, Torrent wave river, a wave pool, surfing wave and an arcade and children's activity pool. Wasserfest is climate-controlled, with both air and water temps maintained in the 80s - so families can relax in steaming warm waters and enjoy summer fun all year long. There are many chaise lounges around the faux-beaches of both indoor and outdoor wave pools and wading pools. Shaded Picnic tables are spread all over the park for picnic events. There are food and beverage kiosks at over 12 locations in the waterpark. This include the BBQ Haus and a grill that serves burgers and chicken strips. The amusement park also allows guests to bring in their own food and drinks. No alcohol and no glass bottles are permitted in the Schlitterbahn Galveston park. Parking is available at a huge nearby parking lot for free. The rest rooms have showers and tables for changing and lockers are available for a rental fee. How to get to Schlitterbahn Galveston Waterpark. From I-45 South, exit at 61st Street and turn right. Go to Seawall Boulevard and turn right. Turn right on 81st Street, then left on Lockheed Street. The parking lot is on the left. The 2010 Summer Season runs April 24-September 19. The park is opens at 10am to 6pm, 7pm, or 8pm. Groups of 15 or more may qualify for a group discount.